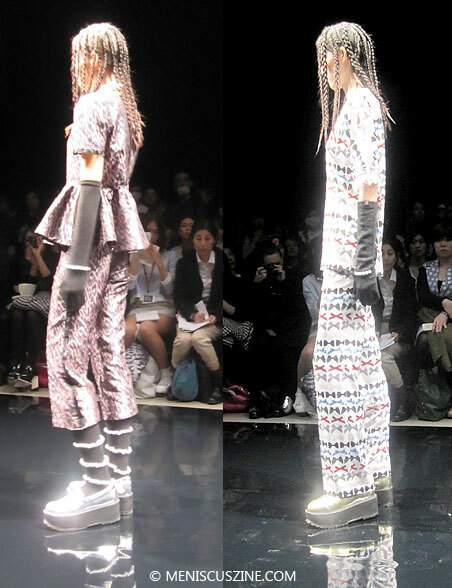 fleamadonna is a popular Korean womenswear label designed by Jei Kim, but its Fall 2014 collection is actually suitable for the typical Harajuku girl, as evidenced by some of the young attendees dressed in similar styles at Kim’s Tokyo Fashion Week runway show. This is a collection for the young woman who wants to make a big fashion statement. Prints and cuts were bold, matching the collection’s theme of the “Rain-bow,” resulting from a collaboration with Osaka artist Erico. These shone throughout a series of loose cropped tops, peplums, A-line dresses, letter jackets and tops – although one white, ribbon-printed outfit did not quite fit in, instead resembling pajama-wear. Kim also with worked Seoul-based footwear company Reike Nen to produce Doc Martens-like, metallic platform shoes. These were accented with socks featuring strands of pearls sewn into and wrapped around them. Other notable accessories included bubblegum pearl chokers.